I added a poem to the reading section today. It’s called “The Open Button“. I’d also like to quickly feature two very unique and distinguished pixel site layouts with the theme of Christmas. 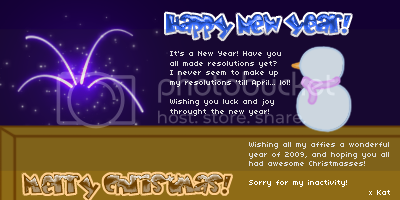 I would have featured more but several other websites I was thinking of had their theme changed to New Year. The first layout is by Suzy from Poke A Dot* (Ha! I had originally misspelled it “Poke A Dog”. :P). It was started way back in November to be ready in time for the season. Isn’t it lovely? I’ve never seen one quite like it. So feast your eyes and make the most of it before the layout is changed on Suzy’s website! The second layout I wanted to show you is by Zuri from Recortes-y-Recuerdos*. So those are my two picks for best pixel Christmas layouts. Have you got any to suggest? Very cute sites. I’ve been to Zuri’s site before, and noted awhile back how adorable it was. Suzy’s is just as cute too, of course! Yes I do celebrate Christmas, I’m having a good time with my family. We’ll be celebrating until January 6, that’s the Three Kings day. And you? Do you celebrate the holidays? ?